BART and city leaders recently took the first steps toward a mixed-use housing development on the station's parking lots, but there's still a long road ahead. There appears to be support for some new housing at North Berkeley BART. In its early days, BART bulldozed houses to build massive parking lots for commuters to San Francisco, devastating several low-income communities in the East Bay. But then in the mid-1990s, the transit agency started a shift toward building housing, office, and retail around its stations instead. And during the past 15 years or so, the agency has been planning developments at most of its stations with surface parking lots — including projects at Ashby station in Berkeley and at most of its above-ground Oakland stations. But the stations surrounding some of BART's most desirable real estate have been excluded from development planning so far. For example, despite high home prices around the Rockridge BART station in North Oakland and the fact that it's only a 20-minute ride to downtown San Francisco, BART has produced no development plans for the area to date. For North Berkeley, a 25-minute ride from San Francisco, BART has at least considered building on the land. An overview of BART's transit-oriented development strategy provided to this reporter last year included a map of existing, planned, and future development. North Berkeley was listed as a site for potential future development with 100-percent affordable housing, but BART had no more specific plans than that. Both Rockridge and North Berkeley are considered urban neighborhoods in BART planning documents, indicating that the agency might seek to build a mid-rise development of roughly seven stories. And last week, BART and Berkeley city leaders took the first tentative steps toward building housing at the North Berkeley station. However, if a town hall meeting held March 15 is any indication, it promises to be a very lengthy process. 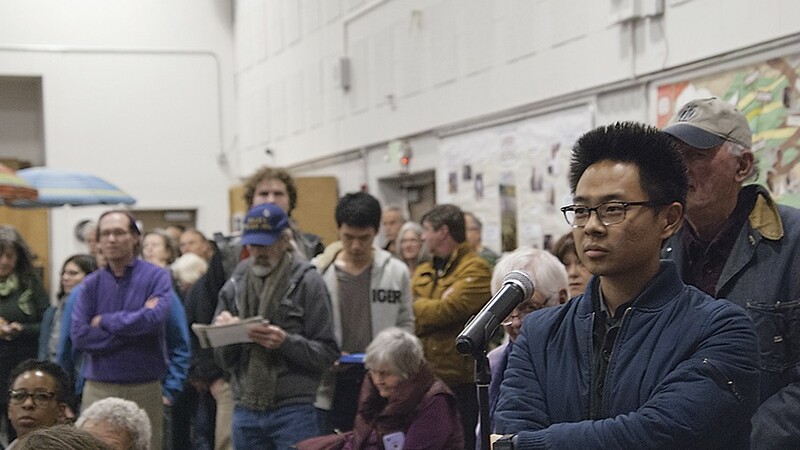 At the meeting, BART director Rebecca Saltzman, Berkeley Mayor Jesse Arreguin, and City Councilmember Linda Maio discussed the possibility of building on the land with hundreds of residents who packed a large auditorium at the Berkeley Adult School. "We're in a housing crisis, so now we're looking at all possibilities to build affordable housing for people," Arreguin said. Val Menotti, BART's chief planning and development officer, said during a presentation at the meeting that BART would likely be interested in building a mixed-use development at the site with both housing and retail, with a strong affordable housing component. BART set an affordable housing policy in 2016, setting a goal to have at least 20-percent affordable housing at each station. In general, residents were supportive of the idea, particularly to build affordable housing. Darin Ranelletti, a neighborhood resident who lives on Chestnut Street, lamented how the neighborhood is becoming less diverse. Earlier that same day, Ranelletti was announced as Oakland's first policy director for housing security by Mayor Libby Schaaf. "Our neighborhood has changed a lot," he said. "Our block is becoming richer and whiter just like Berkeley is becoming richer and whiter." Dan Leaverton, who lives two blocks from the station, encouraged BART to build affordable housing on the four acres of developable land there. "There can be no better purpose than to build affordable housing instead of surface parking," he said to applause. But some residents still were concerned about how any development at the station would affect parking, which they said is already tight from overflow from the BART station, and how increased traffic might affect congestion and upkeep on roads. Arreguin indicated that he would seek assistance from developers for improving infrastructure. "Our city is growing and our infrastructure is very old," he said. "I do think that developers should contribute to help us build that infrastructure." Residents were also deeply concerned about proposed statewide legislation that would force cities to allow the construction of taller buildings near transit routes and fearful that BART would attempt to build a very tall building there. Assembly Bill 2923, introduced in February by Assemblymembers David Chiu, D-San Francisco, and Tim Grayson, D-Concord, would require cities to allow taller and denser developments on BART-owned land. And Senate Bill 827, introduced in January by state Sen. Scott Wiener, D-San Francisco, and co-authored by state Sen. Nancy Skinner, D-Berkeley, would mandate that cities and counties allow housing projects of up to 55 feet to 85 feet near transit. Arreguin said he opposes both bills in Sacramento, to thunderous applause. While BART's construction in the 1960s was a major transportation project in the Bay Area, Berkeley was spared the worst impacts of it. Above-ground BART tracks, which are far cheaper to build than underground tracks, sliced through large swaths of Oakland's poorest neighborhoods, but Berkeley residents voted to raise taxes to install the tracks underground. Another speaker at Thursday's meeting, Aaron Eckhouse, argued that the makeup of the North Berkeley neighborhood had more to do with exclusionary zoning practices — when wealthy white neighborhoods prevent integration by only allowing single-family homes. He drew loud boos, and Arreguin had to warn the audience to respect each person's right to speak. "Low-rise, low-density zoning has historically been a tool to exclude low-income people of color," Eckhouse said. Some residents were concerned that BART might attempt to construct a high-rise at North Berkeley BART, like the 260-foot tower under construction at the MacArthur station in Oakland. This concern was at least partially fueled by misinformation from a group calling itself "Friends of North Berkeley," which distributed a flier claiming that the city and BART had plans to build four buildings there, with one towering 31 stories. However, no such proposal exists. The photo included on the flier was from a game played during a social gathering for the pro-housing group East Bay for Everyone. The group was stacking cardboard models of buildings onto a printed overhead photo of the North Berkeley station while drinking at the bar Spats. They took a photo and posted it to Twitter. A member of the Friends of North Berkeley group present at Thursday's meeting declined to discuss the flier with the Express. In fact, it may not even be possible to build a high-rise at that location because of the configuration of the tracks, which run diagonally under the parking lots. But there also has been no study of that possibility nor are there any plans to study it in the foreseeable future, according to BART spokesperson Alicia Trost. For BART, transit-oriented development has several advantages. By building more housing around its stations, it encourages more people to ride and brings in more fare revenue. BART also stands to benefit from revenue streams through development deals and rent. And by encouraging public transit, it's better for the environment, helping reduce reliance on fossil fuels. Just in the last few months, BART has hit milestones for several of its transit-oriented development projects. It issued a request for qualifications seeking a developer for a high-rise development at the Lake Merritt station earlier this month; it recently finished reconfiguring the Walnut Creek parking lot to accommodate construction of a new parking garage; and it broke ground at Casa Arabella, a 94-unit affordable housing development that is part of the second phase of the Fruitvale Transit Village, one of the first transit-oriented development projects BART took on. BART has completed projects throughout the East Bay, including at San Leandro, South Hayward, Union City, and Pleasant Hill. Construction is underway at MacArthur and planning is ongoing for housing and office space at the West Oakland station.